Attelia, Adalia, and Antalya, the different names of the city throughout the long history, is the pearl of Turkish tourism industry and known as Turkish Riviera by holiday-makers with its wonderful weather conditions, sandy beaches, historical sites reflecting old civilizations, available accommodation facilities to suit all budges, splendid landscapes, breath-taking bays and incredible sunset views. Antalya is also the fifth most populated with over two million inhabitants and sixth largest city of Turkey in size. The city has a great fame not only by foreign tourists but also Turkish visitors enjoy spending some time to see historical beauties and to have a rest once in a life time so it is a “must “ to go. It has been growing year by year and the ones who spent some time in the past would like to come and to be here several times again. The city has the most archeological sites of Turkey as if the center of the old civilizations. The kingdoms, the municipalities, the great empires, Hittites, Lycians, Lydians, Pamphillians, Pergamons, Romans, Byzantines, Seljuks, Ottomans and finally the Turks have made a great effort to adorn the city with their signatures in which we can pay visits as sights today. 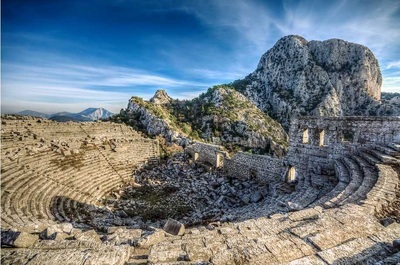 Find the best Antalya tour packages online on tourmakerturkey.com. Our user-friendly site provides a convenient platform for you to compare and choose half or full day Antalya city tours. Our aim is to offer travelers with a simple, speedy and reliable method to book their Antalya tours. Antalya is located in the west of the Mediterranean region and in the south of Turkey. The city is surrounded with Mediterrenean Sea in the south, Mugla in the west, Burdur and Isparta in the north, Konya, Karaman and Mersin provinces in the north-east. It is a gateway between Aegean and Central Anatolia regions. It is also the important port city for east Mediterrean Cruise ships from Malta, Algeria and North Africa as well as Cyprus Island. The area has a big river called Aksu and some small streams with some waterfalls on. 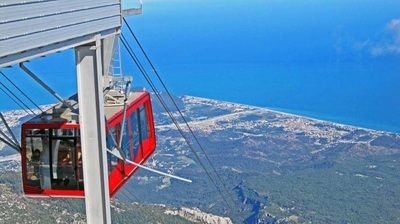 It is very easy to reach Antalya by air, by sea and by road due to available connections from all over the world. Many leading international airlines fly directly to Antalya airport as scheduled flights throughout the year and charter flights during the high seasons between April and November. Domestic Turkish airlines also fly to Antalya several times a day from Istanbul, Ankara, İzmir, Konya and touristic cities of Turkey. Road connections with nice highways are also avaiable for travellers by their cars and by coach. Many cruise lines sailing from European and Greek Islands ports call at Antalya. Turkish government has been paying a great attention to Antalya in order to connect with all over Turkey. Antalya and its environment has an excellent climate and the region has about three hundred sunny days throughout the year which is avaiable for either having a holiday or settling down as an inhabitant. The long summer over seven months is hot and dry, the winter is warm and rainy as the typcial examples of Mediterrean climate. It never snows in Antalya so the pheasants are able to harvest at least three crops in one year so it is known as agricultural depot of Turkey. Everything is grown here because of good weather conditions. The region is full of orange, mandarin, banana, olive orchids, cotton plantations, palm trees and green houses to grow vegetables in winter. The annual average temperature of 18.7 C degrees for 12 months a year makes the tourism activities avaiable all year round. Attelia was added to Roman province of Asia in 67 BC by Roman commander Isacurus and it became the base of Pompey’s fleet. St. Paul also visited the Perge town during his third missionary journey and sailed to Rome from Perge. In 130 AD Roman emperor Hadrian paid a visit to Attelia and the town began to get developed after his visit. Till the end of Roman era, a lot of Roman buildings in and out of Attelia were built such as Hadrian gate, agoras and Roman theatres. During the Byzantine rule, Attaleia was the Episcopal center and Turks took over the city in 1207 which has greatly improved with a new name . Seljuk Turks have invited all Turkish immigrants to settle down both as Nomadic tribes on the hills with thousands o flock of sheep and goats and other Turkish tribes to found new towns in the area in 13th century AD. One of the Seljuk Sultans called Aleeddin Keykubat established a new town called “ Alaiye” about 150 kms away south of Antalya with a great shipyard to make warships and he began spending his winters in Alaiye because of the mild climate. 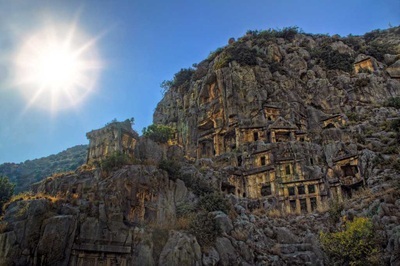 During the time of Anatolian Principalities, Antalya became one of the tributaries of the Teke tribe as the dominance of Hamitogulları and the area was noted for Teke region. In Ottoman era Teke region was state centre of Central Anatolian province where Antalya is located now. The famous Ottoman traveller Evliya Çelebi indicated that Antalya had a big castle, twent-four big neighborhood outside the castle, , four quarters and three thousand houses in the second half of XVII century. According to Evliya Çelebi , Antalya harbor used to have 200 ships capasity. Later in the beginning of 19th century, Antalya added to Konya province and it became one of the settlements where the immigrants from Caucasian and Balkan countries were settled down and the city became very cosmopolitan in demographic situations. In 1923 Turkish republic was proclaimed by Atatürk and democratic rules were set up as a secular country. After the Latin alphabet was accepted in 1928, the ratio of reading and writing people has increased rapidly and the city began growing with new opportunities so it got developed in between1950-60. Tourism began and Turkish government declared the region of Antalya as the center of tourism in Turkey and invited to all enterprises to make investment for big travel companies with tax free facilities in 1980s. In Twenty years both Turkish and foreign enterprises have made luxury hotels, holiday villages, penisons, guest houses, international chain store hotels and nice restaurants so Antalya has became the capital city of Turkish tourism industry in a short time. Today more than 15 million visitors from all over the world come and spend their holidays here and about 100 destinations both in European and Asian cities have a direct flights to Antalya. It has been a popular holiday resorts of Turkey known as Turkish Riviera since the year 2000. One out four the whole population of the area are involved in tourism business. Antalya has not only the natural beauties with long sandy beaches to have a sunburn, the splendid coastline to swim and to surf, waterfalls to take pictures, hills to climb and canyons for trekking, but also are noted for with a lot of historical sites as the home of ancient civilizations, monuments to understand of the history and edifices to be in which millions of tourists would like to see and to spend some time each year. Here are some selections of the sight-seeing places in Antalya city. 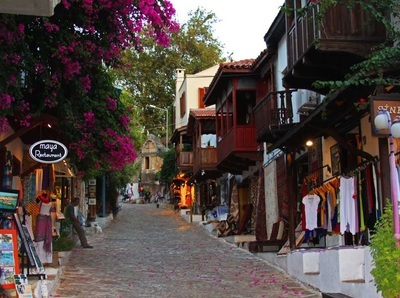 Altough most of the parts have been destroyed, Kaleiçi is reflecting the old way of life of Antalya city with its old buildings, bars, and restaurants in horse-shoe shape surrounded with interior and exterior walls of the castle. The walls are the common work of Hellenistic, Roman, Byzantine, Seljuk and Ottoman periods and has eighty towers. There are about 3,000 tile-roofed houses behind the walls present not only the old way of life but also architectural orders and traditions to the visitors. It was declared as the protected area by Turkish Minsitry of Culture and all the houses have been preserved to be restored in time. At present the area is well known entertatinment centre with restaurants, bars, small boutique hotels and penisons. Summers are hot and dry and winters are warm and rainy so the old houses were built to keep the householders from sunshine and to keep them cool. Antalya houses have three-storeys and a long courtyard with shadowed stone paths to make the houses cool in summer and warm in winter. The first floor is used as the entrance hall and the warehouse. It is first Turkish structure in Antalya and is located near the harbor in the city-center. According to the inscription, it was built during the reign of Seljuk Sultan Alaeddin Keykubad in between 1219 and 1236. The body of minaret is built with red bricks consisting of eight half-cylinders. If there were a mosque near the minaret, it should be demolished in time because the mosque near the minaret was built later in 1372. The Grand mosque is also known as truncated Minaret mosque. In fact, it was built as a basilica in the fifth century and was converted into a mosque when the Turks came. A little remaining part of the first work is still standing and the whole building was repaired during the Ottoman period. One large part was used as a Mevlevi lodge in the early Ottoman period and then in Classic Ottoman times it was used as a mosque again. Transportation was provided with horses and camels as caravans until the early 20th century and the trade goods were carried by these animals from one place to another. Caravans were stopped on the roads and spent the nights in caravanserails in secure that is why caravanserails were built on the trade routes. Evdir is one of them to be the secure home for caravans clients and animals. 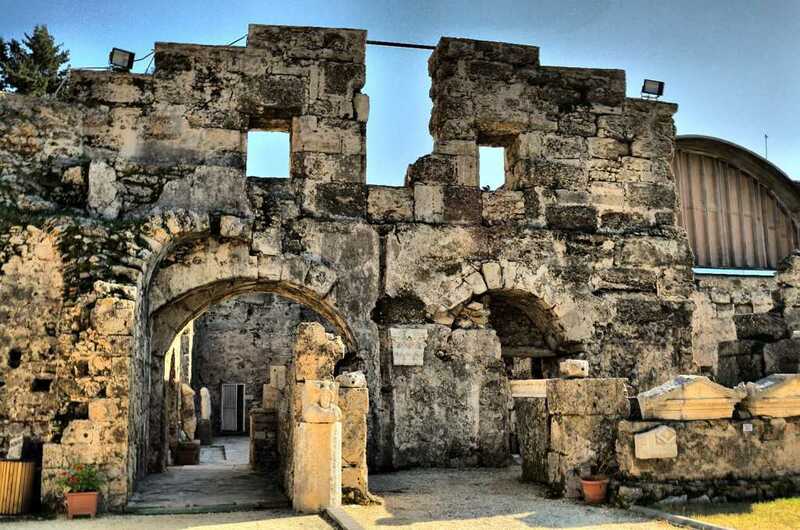 It is about 18kms far away from Antalya city-centre and was built in 12th century with a nice portal gate. Duden waterfall, situated 10 kms northeast from downtown , is one of the natural beauties of Antalya city. Water poured from a height of 20 meters. The main source is located Kırkgöz-Turkish saying forty eyes. It grabs the visitors with a splendid sound and view. One of the most crowded beaches in Antalya area in summer with thousands of swimmers in different nationalities. It has a long beach with about 20 miles on the way to Kemer noted for all over the world as the recreation centre of Antalya province with luxury hotels and parks. It is almost impposible to find a place to lay down in summer months beacuse of the huge crowd. It is best preserved historic structure of Antalya and it was built on behalf of the Roman Emperor Hadrian in 130 AD. This gate has not been used for many years because the city walls enclosed it so it was preserved in better condition. It was made from marble with columns and has three arches with sculpted ornaments in beauty. It is believed that the orinal gate used to have two-storeys with two towers on. One of the towers is known Julie Santa without freezes in the south and the one in the north has no name. When you walk through the gate, you will reach the old town of Antalya called Kaleiçi today. It is illimunated to have a nice scenery at night time. Clock tower is located in the district of Castle gate and it was built by Grand Vizier Said pasha on behalf of Sultan Abdulhamit II in 1901. The plan of the clock tower is built on a square body and has three parts. It has been renewed recently and the dial plate is only the orginal remain today.